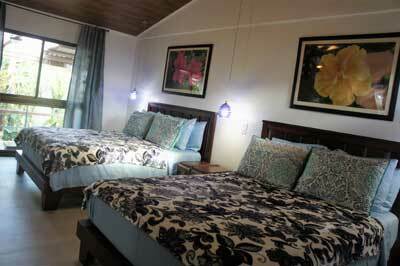 Our Mora Room is located in the main house, second floor, very bright and comfortable. Queen size bed, private bathroom with shower. 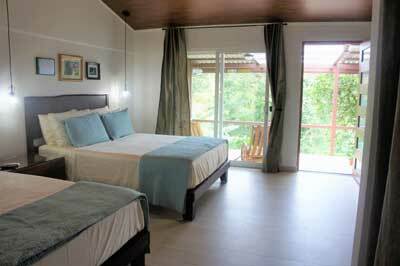 Large balcony with amazing views of Arenal Lake and Volcano as well as rainforest, shared with The Banana Suite. Our Cas Suite is located in the main house, first floor, bright and spacious with additional private entrance. Queen size bed, private bathroom with shower, handicap accessible, private sitting area. With view of rainforest. Our Guava suite is located on the bungalow next door to main building, small seating area, private entrance with terrace and view of the rainforest on our back yard. It has two queen beds and sleeps up to 4 people. A/C, mini-fridge, free Wi-Fi, hot water. Our Mango suite is located on the bungalow next door to main building, private entrance with terrace and view of the rainforest on our back yard. It has two queen beds and 1 twin bed, sleeps up to 54 people. A/C, mini-fridge, free Wi-Fi, hot water.